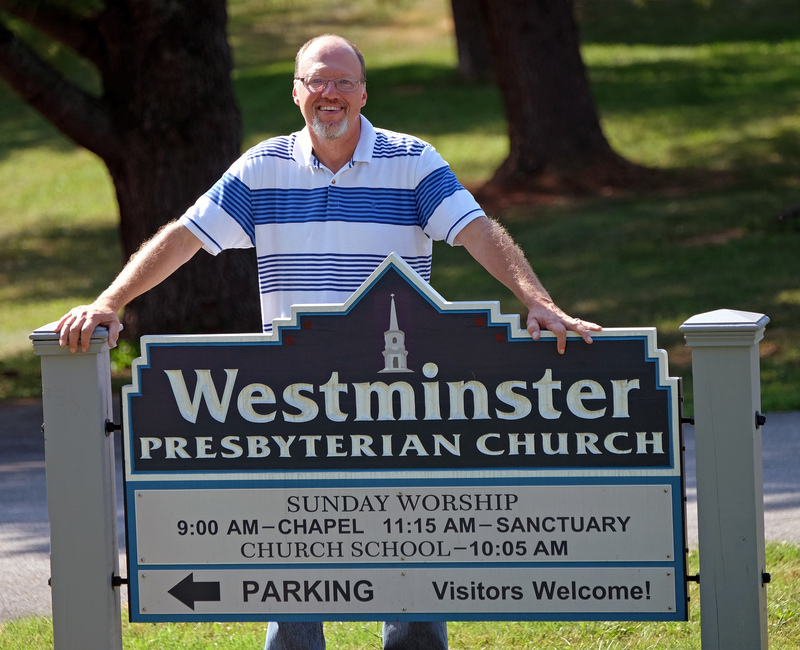 Mark Hackley, President Augusta Sign Company, with a church sign he’d made, Friday, September 9, 2016. (Photo by Norm Shafer). Augusta Sign Company is a full-service design-build sign company, constructing wooden, electric, stucco and vinyl signs that grace the entries of businesses and residential neighborhoods across the Shenandoah Valley. Mark Hackley, its owner, may be an artist, brand-designer, and licensed Virginia Contractor – but don’t let his slick signage confuse you into believing he is a large, impersonal business. 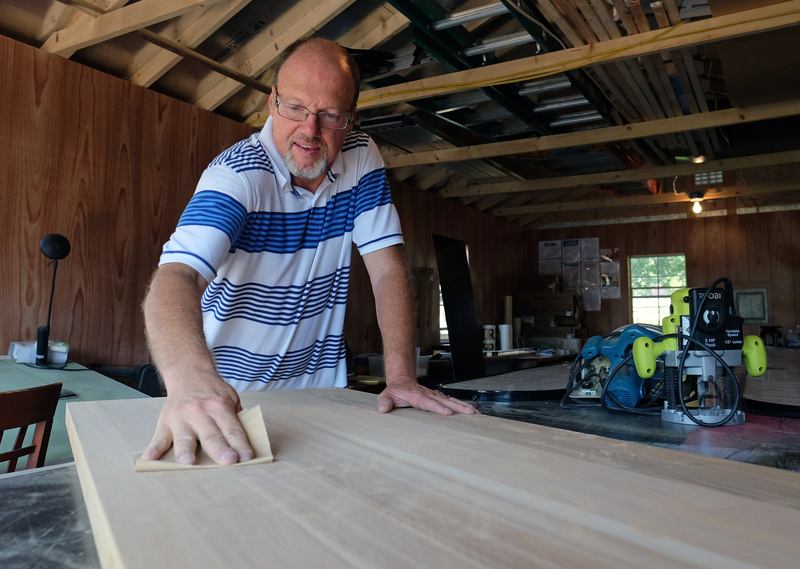 We caught up with him in his backyard workshop in the Waynesboro Tree Streets, where he told us how local entrepreneurship is helping him build the community and lifestyle of his choosing. Mark Hackley, President Augusta Sign Company, sands a cedar board that was going to be the back ing of a metal sign, Friday, September 9, 2016. (Photo by Norm Shafer). Mark Hackley, President Augusta Sign Company, carries a sign into his shop to repair, Friday, September 9, 2016. (Photo by Norm Shafer). 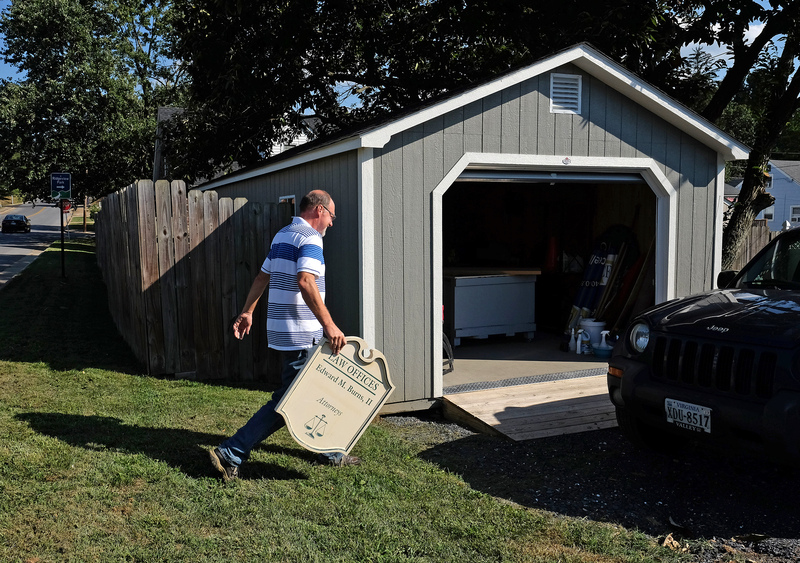 When Mark decided to open Augusta Sign Company, his wife bought him the workshop building that now anchors their backyard, giving him creative design and construction space. His commitment to balancing family and work is obvious, as he gives a tour of his workshop while rearranging appointments to make time to visit his mother, who is recovering from a recent health scare. 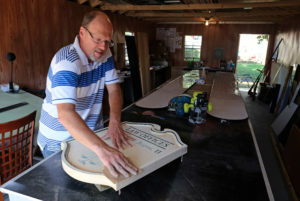 His goal is not to compete for all projects at all times, but to carve out lasting relationships, to offer custom products like wooden and large-scale signs, and to combine quality products with customer satisfaction. 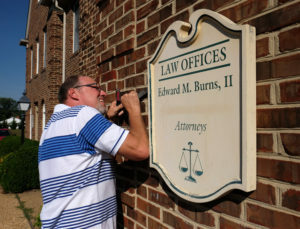 Mark Hackley, President Augusta Sign Company, takes down a sign he made to repair, Friday, September 9, 2016. (Photo by Norm Shafer). Mark Hackley, President Augusta Sign Company, sands an old sign he’d made in preparation for repainting it, Friday, September 9, 2016. (Photo by Norm Shafer). Mark is open and shares freely about the challenges of entering a market where there is lots of competition and price pressures. 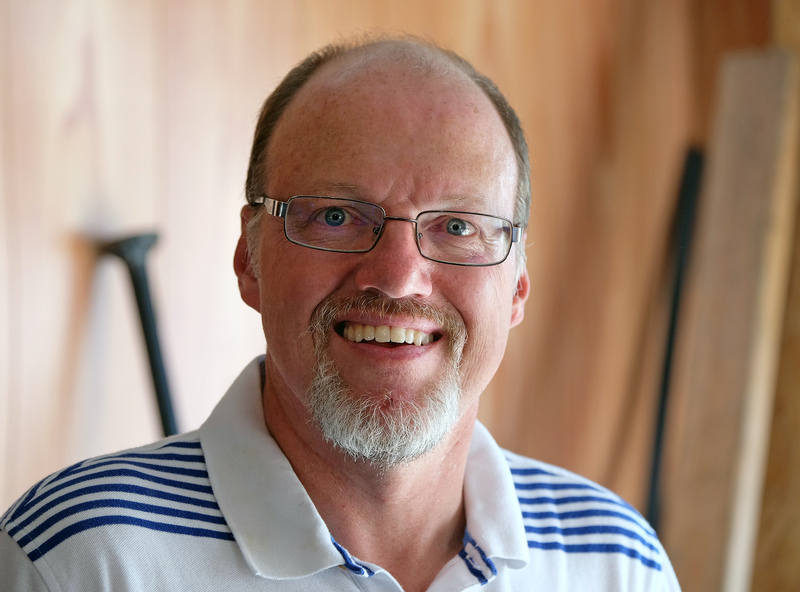 In his own experience, he says, an important strategy has been to ensure that customers are comparing apples to apples – just because another business is offering a cheaper product doesn’t mean that it is offering an equivalent product, and identifying and understanding those differences has been key to his success. He also advises fellow start-up entrepreneurs to ensure that they’ve built a cushion of start-up capital to draw upon in times of growth, unexpected expenses, and to support the upfront cost of large jobs. Mark Hackley, President Augusta Sign Company, Friday, September 9, 2016. (Photo by Norm Shafer). As he talks through lessons learned and the rewards of small business ownership, Mark drops many names of local residents and businesses who have helped him along the way. Some are former customers from many years ago who have provided him with support, referrals, and a warm welcome back to the market when they learned he had opened a new business. Others include a retired friend who still helps him with equipment, installs, trailer hookups, and more. Having a network of support clearly counts as one of Mark’s biggest rewards of entrepreneurship. And of course, check back often at growwaynesboro.com/entrepreneurs to see the stories and faces of the many entrepreneurs building Waynesboro’s local economy. This is a wonderful article on a wonderful man. Mark is very talented artistically and musically, and has an amazing ability to connect with people. If I needed a sign made, he would be the 1st person I’d go to, because of his attention to detail and the fact that he loves what he does. And that is the beauty of small businesses.